I have missing teeth – what can I do? From implants to permanent bridges, you have several options to replace missing teeth and blend them with your natural teeth. Using advanced materials and tooth-colour matching techniques, your Prosthodontist or Periodontist can recommend the appropriate method for optimal function and aesthetics. There are a number of ways to straighten teeth. The most common way is by using braces or other appliances such as aligners. Speak to your Orthodontist today to find out more about getting that perfect smile. People get braces for medical or cosmetic reasons. We will always be as gentle as possible and most if not all treatments can be managed with little or no discomfort. My dentist told me to see a Prosthodontist. Why? Generally, Prosthodontists treat the more difficult or complex problems that require oral reconstruction. Sometimes replacing a single tooth or crown may provide the most challenging cosmetic issues and a higher standard of care may be necessary to provide the best outcome. If you have been referred to a Prosthodontist, your general dentist may have identified that you require specialist care and by referring you they have placed your wellbeing first and want the best for you. My dentist told me to see a Periodontist. Why? Your general dentist may refer you to a Periodontist if you exhibit the symptoms of gum disease. However you may schedule an appointment by yourself if you have concerns about your oral health. Tooth whitening is a safe treatment when carried out by your dentist. Cabramide Peroxide is a substance that should be handled with care and this is why your treatment should be done by your dentist. Whitening does not affect the strength or health of your teeth and it is a completely safe treatment to have done as long as your teeth are healthy. We do have our general dentistry fees listed here. However, for patients requiring a lot of treatment or complex treatment we are happy to discuss the costs with you and a payment plan if you so wish in order to make life a little easier for you. Will my health insurance cover any of the cost? Depending on your type of health insurance and whether you are covered for dental treatment, a proportion of your dental treatment will be covered. It is advised that you contact your insurance provider for more information. Bleeding gums is caused by inadequate plaque removal. Plaque contains germs which attack the healthy tissue around the teeth. This will cause the gums to become inflamed and irritated, which may cause them to bleed when brushing or flossing. This is called gingivitis and is the first stage of gum disease. Gingivitis is usually a painless condition and bleeding gums may be the only symptom. Some other signs may include: swollen, red or tender gums, persistent bad breath or taste, teeth that are loose, and a change in the way your teeth fit when you bite. At this stage, the disease can be treated and completely reversed. So it is important not to ignore your bleeding gums. Brushing twice a day and flossing every day will help you with managing this issue. This is a procedure that replaces either a single missing tooth or multiple missing teeth using dental implants. The implants are placed on the same day the teeth are removed and replaced. Replacement teeth are fitted on the same day and you should leave the clinic looking the same, if not better than when you went in and the artificial teeth are firmly anchored to the implants on that day. This procedure is very successful. However, it is not for every patient and needs to be carried out by a team of competent and successfully skilled practitioners. Unfortunately, you will find incidences in the press where the procedure was carried out by unskilled practitioners and the procedure failed causing undue stress to the patient so it is important to understand the risks associated with this before starting. Your Prosthodontist or periodontal surgeon will discuss your individual case with you and explain to you whether you are a suitable candidate. Why do I need a specialist for my dental treatment? If you have been referred to Harcourt Dental Clinic, then your general dentist has identified that you may require specialist care and by referring you they have placed your wellbeing first and want the best for you. If you expect a higher level of care than you would find at a general dental practice then you would most definitely get this with having a specialist assess and treat you. If you want a second opinion on a proposed treatment then either your dentist or you may refer you to Harcourt Dental Clinic for an assessment. If you have been recommended to get the opinion from a Prosthodontist, you can expect on your first visit, to have your options broadly outlined to you. Usually X-rays are taken and dental models of your teeth are constructed and a more in depth evaluation of your dental options will be discussed at a later date. Sometimes a decision can be reached fairly quickly on your treatment however only after you fully understand what procedures are involved, the costs, length of time treatment will take and how long individual treatments will take. You will be able to discuss all your concerns and receive the appropriate advice on your dental condition and ultimately the decision about any of your dental treatment will be up to you. 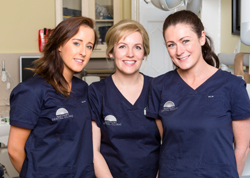 We have been placing dental implants in Irish patients for the last 30 years. We have seen the easy and the difficult, we understand how our patients live with dental implants. We also understand the importance of looking after both the implants and our patients. We’ve treated all manner of difficult implants and patients where implants were previously thought impossible. Our specialist team of Prosthodontists, Periodontists and surgeons will help you make the right choice for now and your future. Many patients ask us what the difference is between general dentistry and cosmetic dentistry. Some patients believe that general dentistry is all about tooth health and cosmetic dentistry is only about the aesthetics of a smile. However, that is only partially correct. Cosmetic dentistry treats the same dental problems that general dentistry treats while maintaining or improving the natural beauty of your smile. A cosmetic dentist furthers his/her skills in cosmetic treatments by attending numerous additional courses and programs dedicated to this area of expertise. Why should I not go abroad for my dentistry? At Harcourt Dental Clinic we understand there is temptation to travel abroad to seek cheaper dental treatment. However, the decision to travel abroad should not be taken lightly and based on price alone. We have in the past and will in the future continue to treat a large number of patients whose treatments have failed or have not lived up to what they were promised. Unfortunately, when complex dental treatment goes wrong, it can cause pain, infection and ultimately failure of the treatment leading to anguish and a feeling of helplessness. Remember the larger number of teeth treated the greater the complexity and risk factor. We advise that you do your research and seek the opinion of your dentist or specialist. Having to travel back and forth with a dental issue may become very stressful and time-consuming, not to mention the added cost of this. Can I be ‘sedated’ for my dental treatment? For patients who may be anxious or would just prefer to be sedated we offer a range of different options to make you feel at ease. If you are experiencing tooth pain, there could be a number of contributing factors. In most cases, toothaches are caused by dental problems, such as a dental cavity, a cracked tooth, an exposed root or gum disease. If you are experiencing tooth pain, don’t take it lightly. We recommend that you book an appointment as soon as possible so we can treat the problem and stop the pain. I have sore jaw joints. Why? The jaw joint, medically referred to as the temporomandibular joint or TMJ, is made up of the bone below the mouth (the mandible, commonly referred to as the jawbone) and the bone just above the mouth (the maxilla). The TMJ allows the upper jaw to close on the lower jaw and is one of the most frequently used joints of the body. The temporomandibular joints are complex structures containing muscles, tendons and bones. Injury to or disorders of these structures can all result in pain in the jaw area. Jaw pain may occur on one side or on both sides, depending upon the cause. Also depending upon the exact cause, the pain may occur when chewing or may occur at rest. Additionally, other medical conditions not related to the TMJ may cause perceived pain in the jaw area. It is recommended you consult your dentist or dental specialist to deal with this issue and treat as required. This is also known as gingivitis which is a mild inflammation of the gums caused by dental plaque. This in turn may lead to a more severe form of gum disease called Periodontitis and your dentist may refer you to a Periodontist for treatment. Smoking can have a major effect on both the teeth and surrounding gum which in turn can cause bad breath. Eating certain foods may also cause bad breath and certain medicines may also have halitosis as a side effect. This is where one of your teeth has become infected and caused an abscess. Often times there may be tooth decay at the root cause of the abscess. A large filling or dental restoration close to the pulp or nerve of the tooth may also cause the tooth to die off and form an abscess. I snore or have sleep apnoea. Why? How Is Sleep Apnoea Treated? If you have sleep apnoea, talk with your doctor or sleep specialist about the treatment options that will work best for you. Sleep apnoea is treated with lifestyle changes, mouthpieces, breathing devices, and surgery. Oral devices may be used to relieve mild sleep apnoea. A mouthpiece sometimes called an oral appliance, may help some people who have mild sleep apnoea. Your doctor also may recommend a mouthpiece if you snore loudly but don’t have sleep apnoea. Your dentist can make a custom-fitted plastic mouthpiece for treating sleep apnoea. The mouthpiece will adjust your lower jaw and your tongue to help keep your airways open while you sleep to give you a clear airway to breathe through by holding the tongue and soft palate out of the way. If you use a mouthpiece, tell your doctor if you have discomfort or pain while using the device. You may need periodic office visits so your doctor can adjust your mouthpiece to fit more comfortably.